The folks at MCA have begun digging into the vaults of the legendary Texas gospel label Peacock Records, a sister label to the also legendary R&B label Duke Records. Owner Don Robey had an incredible ear for talent, to which his extensive roster of artists will attest. 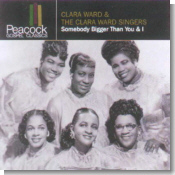 The first release, Clara Ward & The Clara Ward Singers' Somebody Bigger Than You & I, is a very traditional release, but sounds dated by today's standards. If you enjoy "Peace In The Valley", "Swing Low Sweet Chariot," and "When The Saints Go Marching In," and admire great singing, this release is for you. Clara Ward and her various groups had scores of releases and were successful performers for many years. Some of the famous singers who spent time in The Ward Singers were Della Reese, Sarah Vaughn and Marion Williams (but none appear on this release). Although Clara Ward died in 1976, there is still a group carrying her name performing today. The second release is The Williams Brothers' Trust In The Lord. It is a bit more modern-sounding collection. This is impassioned, soulful gospel singing. The Williams Brothers are still recording and producing, and are major influences on the contemporary gospel circuit four decades after their debut. The group had a #1 Billboard gospel hit in 1976. This release contains their breakthrough recording of "Jesus Will Fix It," and is quite different in its approach to gospel than the Clara Ward release. The third release, and my favorite of the trio, is Tessie Hill's I Must Tell Jesus. Hill is a vocalist in the Aretha Franklin mold, and was voted top female gospel artist in 1978 by Record World Magazine. All of these cuts showcase Hill's powerful pipes, with "Leave It In The Hands of The Lord" and "I Must Tell Jesus" as two of the stronger cuts. If there is any criticism in regard to this project, it is the limited playing time of each disc: 28 minutes for the Clara Ward, 32 minutes for The Williams Brothers, and a slightly longer 44 minutes for Tessie Hill. With so many reissues adding previously unreleased and alternate takes, and with the vast amount of material these artists have recorded, these releases come up a bit skimpy in their timings. Since Peacock Records had a vast catalog with such groups as The HiWay Que-Cees, The Soul Stirrers, and The Mighty Clouds of Joy, just to name a few, we can hopefully look forward to many more fine releases in the near future. The incredible Barbara Carr is back with her third release for Ecko Records, and What A Woman Wants may be her strongest to date. There are a few covers, such as Gene Chandler's "Rainbow" and Denise LaSalle's "If I Don't Holler, "and a re-release of Carr's earlier hit "Good Woman Go Bad." When added to a mix of fine new songs by John Ward, this makes for a well-balanced, listenable album. As I have said repeatedly, one good cover song is worth two throwaway new ones. Of the newer songs I enjoyed "A Woman Always Gets Her Way," which reminded me of the classic "Wild Women (Never Get The Blues)". This is the track that should get a lot of airplay. A good outing for Barbara Carr, and a great job by Ecko Records. Much of this release is soul, but there are several excellent blues tunes for all you purists. More please!! I guess as long as reissues continue to sell, there will be many more just like Bobby Bland's Blues and Ballads (MCA). The formula is one or two well known tracks, in this case the everlasting "Share Your Love With Me" and "I've Been Wrong So Long" from the classic 60's album Two Steps From The Blues. Add to the formula a few singles and some killer tracks from his early 70's albums, and you have a very listenable release with 16 tracks of winners that have kept him in the spotlight all these years. Bland's version of Luther Ingram's "(If Loving You Is Wrong) I Don't Want To Be Right" surpasses the original, and his version of "Georgia On My Mind" rivals, but does not surpass, Ray Charles' impassioned version. "This Bitter Earth" and "It's All In The Game" are given stellar performances. Any new Bobby Bland release is a reason for rejoicing, even if the fare is reheated chestnuts. Three deep bows to one of the greatest voices of all time. May his music live and be enjoyed forever. Michael Burks, a winner of The National Blues Foundation's Albert King award, has given us a strong self-produced CD, From The Inside Out. Burks is a deep-voiced singer who wrote all the songs on this release. He sounds like a veteran on this inital outing. At times Albert and B.B. come to mind while listening to this enjoyable CD. It is the title track that could get some airplay, as well as the upbeat "Talk To Me Baby." But it is the incredibly soulful and bluesy "Little Did I Know,"with band member Stuart Baer playing some very cool Hammond organ along with Burks' fine guitar licks, that sort of steals the show. This is one of those fine independent releases you hope gets picked up by a major label, and then perhaps The Michael Burks Band will be playing soon at a club in your hometown. I know I'll be there. 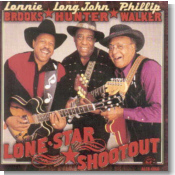 Lone Star Shootout is third concept album of this nature issued by Alligator Records, in that it gathers several artists with similar roots for a monster jam session. The first was the excellent album which teamed up Albert Collins, Johnny Copeland, and Robert Cray, with the second being a big harmonica blowout with James Cotton and others. This disc teams up three stalwarts of the Gulf Coast guitar tradition: Lonnie Brooks, Long John Hunter, and Phillip Walker. A fourth, lesser-known but equally talented, guitarist, Ervin Charles, is also included on some of the cuts. Lone Star Shootout is a great album, as this gathering of old friends brings out the best in each artist. The CD starts out featuring Brooks on "Roll, Roll, Roll," which borrows heavily from his early hit (which was released under the name Guitar Junior) "The Crawl." Walker is featured on a great uptempo, walkin' shuffle, "Boogie Rambler," which gives the great horn section led by Kaz Kazanoff plenty of chances to shine. Charles proves that he's just as good as his better-known pals on the slow blues "Born In Lousiana." Another good slow number features Walker on "I Met The Blues In Person," again featuring the horn section and nice B-3 from Riley Osbourn. Highly recommended for lovers of Texas blues guitar. House of Blues has periodically issued what I like to call "reverse" tributes: blues artists paying homage to rock stars who were in turned influenced by many of those same blues musicians. The latest of the bunch is Blues Power: Songs of Eric Clapton. This is one of the best of the bunch, although some of the material covered sounds a little forced. A highlight occurs on one of Clapton's schmaltzier tunes, "Wonderful Tonight," which Otis Clay turns into a soul anthem. Mississippi Delta pioneer Honeyboy Edwards, backed on harp by James Cotton, turns in a great version of "Crossroads," not surprising since he probably learned it originally from Robert Johnson long before Clapton and Cream covered the song. Otis Rush sounds particularly inspired on vocals on "Old Love." Another standout comes from the combo of Pinetop Perkins, John Hammond and Bob Margolin on their rendition of "Too Bad." You're probably wondering who decided to cover Clapton's rock classic "Layla"...it's Memphis artist Eric Gales, with help from teen Derek Trucks. They do a decent version, relatively close to the original but not a "note for note" cover. Other artists on the CD are Larry McCray, Koko Taylor ("Blues Power"), Carl Weathersby, Buddy Guy (a forced-sounding "Strange Brew"), Bo Diddley, Joe Louis Walker, and Ann Peebles. 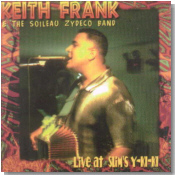 One of the hottest young acts on the South Louisiana zydeco circuit is Keith Frank & The Soileau Zydeco Band. Live At Slim's Y-Ki-Ki (Shanachie) captures this band at their regular gig at the legendary Opelousas dance hall. This CD does what a good "live" recording should do ... it gives the listener the feeling that they're actually at the show. The sound quality is excellent, and the tight band was in good form that evening. Frank plays a mix of traditional and contemporary zydeco. I especially like their use of a heavy backbeat on tunes like "Hold On To It" and "Sometimes We Make You Move Your Feet." For a more traditional sound, be sure to check out the band's version of "�o Fa." Also worth hearing are the catchy and danceable "Chocolate 3-Step" and "Rising To The Top." The latter title sums up what I think about this band's future. I just can't wait to catch them in person some day! Think for a moment of some of the great teammate combinations over the last century: Ruth and Gehrig, Burns and Allen, beans and rice, etc. You can also add the names Morgan and McBee to that list. The latter two names have been longtime teammates in one of Texas' hottest blues bands, Mike Morgan & The Crawl. Morgan is just flat out one of the best guitarists in the entire Lone Star state, while Lee McBee compliments his pal's crisp, yet heavy guitar licks with his own raspy vocals and wonderful harmonica accompaniment. This dynamic duo is back on their latest Black Top Records release, I Like The Way You Work It!. Hottest numbers include the slow blues "Face Down in the Dirt," with fellow Dallas picker Shawn Pittman making a guest appearance, and the shuffle number "The Hammer." Morgan really gets to demonstrate his tasty guitar playing on the instrumental "Flyin' High." One of their best so far. One of the first traditional blues performers who I ever saw was Virginia native John Jackson. It was the summer of '76, I had just moved to Washington, D.C., and Mr. Jackson was a regular fixture at the summer-long Festival of American Folklike during the nation's bicentennial celebration. While it's been nearly 15 years since I last saw Jackon, it's obvious from his new album that he hasn't lost a thing in the intervening years. 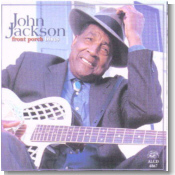 Front Porch Blues (Alligator) is a beautiful collection of acoustic Piedmont-style blues performances by Jackson. An appropriate title was chosen for the disc, as I'm sure that Jackson has performed these 16 tunes many times on the front porch of his home. Opening the CD is a very nice version of the traditional "Railroad Bill," followed by a fine "C.C. Rider." Also interesting is the old country standard "Just Because." A must for fans of traditional blues!!! Veteran blues rockers Savoy Brown, led by guitarist Kim Simmonds, are still going strong, as evidenced on their latest CD, The Blues Keep Me Holding On (Mystic Music). The music here is good, basic blues/rock, with heavy emphasis on Simmonds' slide guitar playing. "Bad Shape" is a strong slow blues with exceptionally good guitar. Guest pianist Dave Maxwell is spotlighted on the blues of "Mississippi Steamboat." I also liked Simmonds' guitar work and passionate vocals on a version of "Little Red Rooster." Another veteran bar band, this one out of Washington, D.C., is The Nighthawks. With the exception of an occasional change in guitar players, this band has had the same lineup for over 25 years. The Nighthawks' new CD is appropriately titled Still Wild (Ruf). Mark Wenner is still one of the best harmonica players around; you'll agree after hearing the original instrumental number "Slow Dance," on which Wenner sounds very much like Little Walter. These old blues guys still know how to rock, as you'll hear on the opening Willie Dixon tune "Tiger In Your Tank." And there are few vocalists as soulful sounding as Pete Ragusa on "The Wild One." The 'hawks can still do it! There's certainly no shortage of "live" B.B. King albums available today. Live In Japan (MCA) is a worthy addition to his vast discography, with good versions of classic songs like "Every Day I Have The Blues," "How Blues Can You Get?," "Sweet Sixteen," and, of course, "The Thrill Is Gone." Recorded in 1971, this CD is not as essential as some of B.B. 's other live albums, most notably the essential Live At The Regal or Live At Cook County Jail. But it's still vintage B.B., which is a whole lot better than most other blues recordings. Funky Blues Messiahs play funky New Orleans blues. The Further Adventures of Reverend P.P. Pettibones Traveling Tent Revival (Trackspotting) is a bit of a gimmick type of album, presenting the band in a 90s-style medicine show. The music is interesting, although I'm not sure if the album will sustain repeated listenings. The vocalist didn't really do anything for me, so my favorite number is the frantic instrumental "Moshing for Jesus," with great gospel piano from bandleader Doug Bare. Best of the rest is the bluesy "Lost In Mississippi," featuring decent guitar from Evan Waller. Blues beginners looking to pick up a good collection of both classic and contemporary blues could do worse than seeking out Essential Blues 3 (House of Blues), a double CD containing cuts from 31 different artists. This set spans a lot of different styles, with 'must haves' like Muddy Waters' "Got My Mojo Working," Jimmy Rogers' "Chicago Bound," Bobby Bland's "Further Up The Road," T-Bone Walker's "Call It Stormy Monday," Professor Longhair's "Go To The Mardi Gras," and many more. Among the newer artists represented are Corey Harris, Alvin Youngblood Hart, and Robert Cray. Not recommended for serious blues fans, because you guys already have everything here. But it's a decent introduction to the blues for the novice listener.